Today I had the pleasure of assisting in a SANCCOB beach cleanup. Due to the large number of volunteers scheduled to work today, a few of us were selected to travel to a local beach and pick up litter. It took us about 15 minutes to get to Lagoon Beach, a beach in Milnerton, one of the suburbs of Cape Town. This beach was chosen due to its location and because it was a lagoon it meant that it probably had a higher concentration of litter. The nine of us set out with bags for both garbage and items that we could recycle. It quickly became apparent to us that this was not going to be a quick job. Along the edge of the lagoon was a rock wall. In the nooks and crannies of this wall we found wrappers, plastic bags, bottles, cans, bottle caps, and straws. We started by spreading out and divided the sections of the wall. From there we moved across the beach until we came to the water. We spent over two hours cleaning the beach and in the end we had six bags of garbage and recyclables and a separate bag for just straws. It was appalling how many plastic straws littered the beach! Straws pose huge health risks to animals. It was disheartening to see the amount of litter on the beach, but as we left we could see a visible difference in the amount of litter. We left the beach feeling very accomplished. I wish I could say beach litter is a predicament unique to this particular beach in South Africa, but ocean pollution is a worldwide problem. There are floating islands of garbage in the ocean that are larger than the state of Texas! Ocean currents carry this garbage all over. I’ve picked up litter several times at various beaches back home in Connecticut and Rhode Island. Mystic Aquarium even holds annual beach cleanups to protect the environment and raise awareness about this global issue. However, beach cleanups are not the only way to combat this issue. If everyone made sure to dispose of their trash responsibly, recycle, and refuse or eliminate their usage of single use plastics there could be a substantial decrease in the amount of trash ending up in the ocean. Purchasing a reusable straw or refusing plastic straws at restaurants is a great way to start! Next time you’re headed to the beach, please consider bringing an extra garbage bag and a pair of gloves in case you come across trash that doesn’t belong there, and remember kids, never pick up trash without an adult’s permission. Sixty-seven miles from SANCCOB, nestled against hills where the mountains greet the sea is a place appropriately named Stony Point. Stony Point is home to one of only three mainland breeding colonies of African penguins. 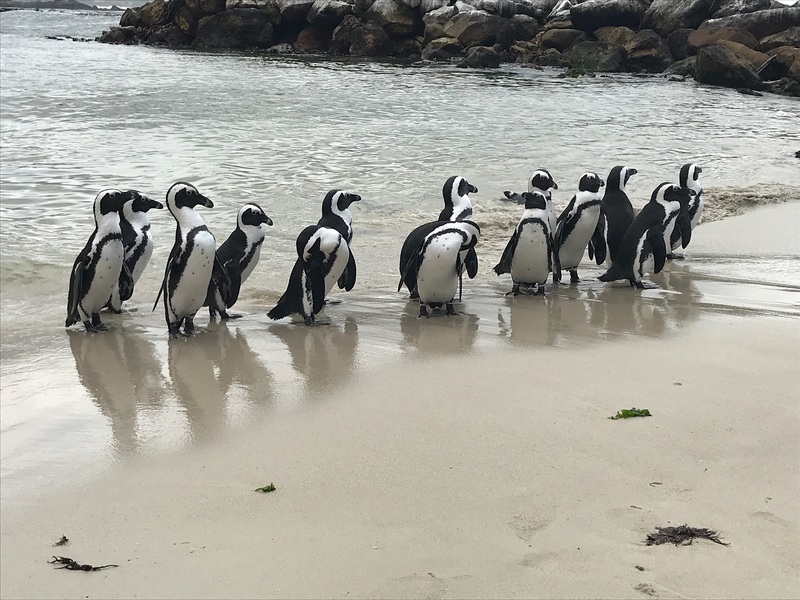 Today I was lucky enough to see Stony Point for the first time and assist in the release of 26 African penguins that had undergone rehabilitation at SANCCOB. Upon arriving at the center this morning, we quickly began loading up the penguins that were to be released. Each penguin’s identification tag is removed, their body measurements taken for research, and their transponder tag, which was placed under their skin a few days prior, is tested to make sure it is reading properly. Six other volunteers were also attending the release and between all of us, we assisted in holding the penguins for their measurements, recording the measurement data, and bringing their transport boxes to the trucks used for the hour and forty-five minute drive. 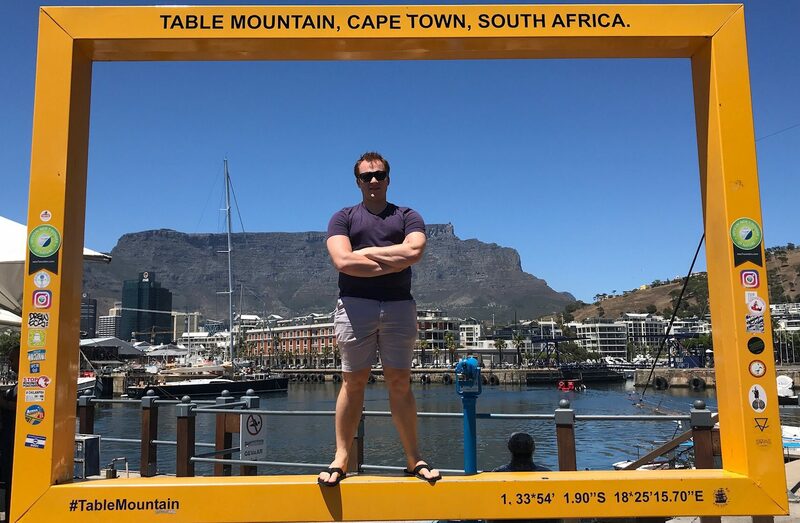 The trip to Stony Point goes through many suburbs of Cape Town and along the coast. We were happy to watch the scenery which included azure waters breaking against rocky shores, kelp beds, and the occasional Cape fur seal. Stony Point itself is exactly that: stony. Many of the rocks and outcroppings have been bleached by the sun, or seabird guano. The ocean water was thick with kelp and crashed against the rocks. The other volunteers and I were eagerly met by several penguin monitors from SANparks who helped us to carry the boxes over rocks and down a couple of hills to a secluded sandy beach where the penguins were to be released. We lined up the boxes and then waited for one of the monitors to count to three. We carefully tipped our boxes on their sides and the penguins quickly exited forming a small group on the beach. We gently ushered them towards the sea where they all entered and swam, still staying in a group. We watched for a few seconds while they all swam away along the rocky coast and out of sight. Twenty blues and one adult had been successfully released. Months and months of hard work, cleaning, formula making, fish prep, and record keeping all led to this very moment. Everyone on the beach was excited and emotional to see them go. 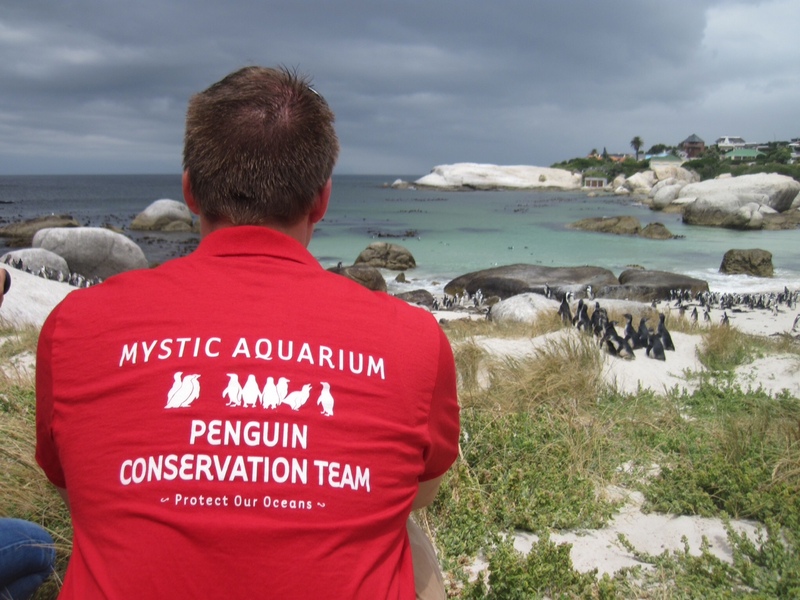 This is the end goal for these penguins and it’s exactly why we all came to SANCCOB. We spent the next hour walking the boardwalk at Stony Point admiring the penguin colony as well as a good number of Cape cormorants, another endangered seabird that SANCCOB rehabilitates at the center. Along the path were numerous graphics educating the visitors about African penguins and their natural history. We could see nests and burrows and even penguins paired up preening each other. Me and the other volunteers kept taking photos and taking in the sights. 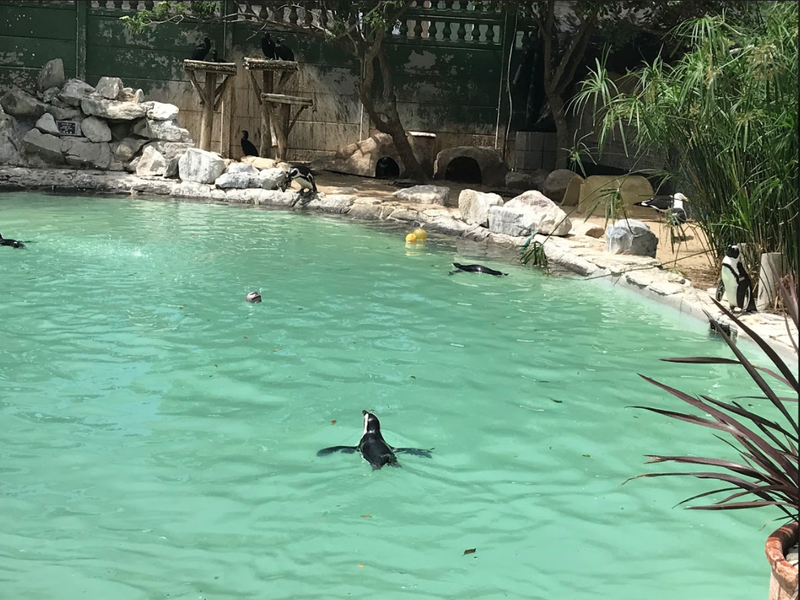 It was African penguin paradise. Then it hit me, soon these penguins could all be gone. Their population once stood in the millions but is now estimated to be less than 35,000 individuals. The worst part is that human related activities such as oil spills, habitat destruction, ocean pollution, unsustainable fishing practices, and climate change are all to blame. Facilities like Mystic Aquarium and SANCCOB are working hard to try to make sure this species doesn’t end up on the endangered species list and we need your help. Visiting the Aquarium or reading these blogs are great ways to increase awareness, but the actions that follow are the most important. Please consider helping the oceans by participating in a beach cleanup, reducing oil consumption, downloading a sustainable seafood app, purchasing reusable shopping bags to reduce our use of single use plastics, visiting zoos or aquariums dedicated to conservation initiatives, or coming up with your own way of protecting the environment. If you want to go the extra mile, consider calling your local politicians’ offices and let them know how much you’re concerned about the environment and ask about what policies can be made to protect it. If we work together and make our voices heard, we can hopefully make sure that species like the African penguin are around for generations to come. At the very least, next time you’re at a restaurant, politely refuse the plastic straw. Myself and the oceans will appreciate it.